Project managers are in charge of a team, planning and executing different projects. An attention-grabbing project manager cover letter can be one of the most important assets in your search for the perfect project management job. Below are two project manager cover letters examples for two applicants with different levels of experience and different career goals. Both showcase a format that covers all the bases needed to make a great first impression before the job interview. Use these examples as a guide for creating your own unique project manager cover letter. I am a project manager with extensive work experience, seeking a position of long-term growth with a stable company. Several of my colleagues in the local Project Managers Association have told me about the open project manager position at Advanced Analytics Consultants, recommending your company as a top company to work with, and I believe I would be an asset to your team in this role. I have graduated from Stanford University, with a BA in Business Administration, and have extensive work experience managing a team. In my current position, I am responsible for organizing and leading projects with a number of cross-functional teams. My duties fall across the board, but always include team selection, goal setting, and managing timetables across the different functions included in each project. Due to my experience in the consulting industry, I understand what it takes to bring clients and internal stakeholders together to deliver collaborative solutions to complex problems, while balancing the needs and expected outcomes of each group. I have achieved great success under pressure at my current job, and have been recognized for bringing struggling projects back from the brink of disaster more than once. In my current senior position, I was able to step into a currently running project, and help existing project managers meet deadlines and deliver results after the team had fallen behind. I know what it takes to motivate and organize people from all parts of an organization. My project outcomes amaze clients and inspire long-term customer relationships. In terms of job-related skills, I have extensive experience using a range of project planning software, including Smartsheet and Mavenlink. Due to my experience in using several quoting development and specification generation systems, I have successfully developed project requirements and timeline expectations directly with clients. A flexible communicator, I am able to speak fluently with highly technical teams, salespeople, and clients with a diverse range of backgrounds and perspectives. Thank you for taking the time to review my attached resume! It seems to me that I would be an ideal fit for this position, and that the company would be a perfect match for my long-term career goals. Feel free to call or email me anytime. I look forward to the opportunity to speak with you in person about how I can help take your projects to new heights, and how we can achieve great things together! I am seeking an entry-level project management position with an up-and-coming organization that thrives on innovation and creativity. I’ve been a user of RapidTrade’s products for several years, so when I saw your job posting for the project management position, I had to jump at the chance to apply! I am a recent graduate of Stark State College, with a Bachelor’s Degree in Management, and I’ve always excelled in project management roles at my recent internship with Megasales.com. Thank you for taking the time to review my cover letter and attached resume! In my current role as a project manager intern, I’ve assisted senior project managers in coordinating several large-scale and small-scale projects from beginning to end. My main duties include communicating with various project stakeholders, gathering information and completed project files, and reporting to my supervisors on daily project updates. In addition, my supervisor has taught me a good deal about workflow planning, requirements testing, and hosting meetings to keep diverse team roles on track throughout a project’s lifecycle. I achieved a 4.0 GPA throughout my Bachelor’s studies, and I excelled in a range of project management courses that led me to pursue this role as a long-term career. I’ve also received a letter of recommendation from my supervisor in my internship, which is set to end in the next 30 days. I am confident that I can bring the same level of dedication into my new role as a full-time project manager, and that I can get up to speed with your processes and workflows very quickly. As a new college graduate, I am well versed in the full range of popular project management methodologies, including the use of Gantt Charts, the PERT technique, and the Critical Path Method. I am also well versed in a wide range of office tools, including the full Microsoft Office suite and Salesforce.com. I have the ability to adapt quickly to new challenges, as I’ve displayed throughout my academic and professional experience thus far. Thank you again for considering my application for the entry-level project management position! Although I am still employed full-time as an intern, I am authorized to schedule a phone interview or meet in person any time that works best for you. I am excited about the prospect of learning and developing my project management skills with your company, as well as moving my career forward at an exciting company like RapidTrade! 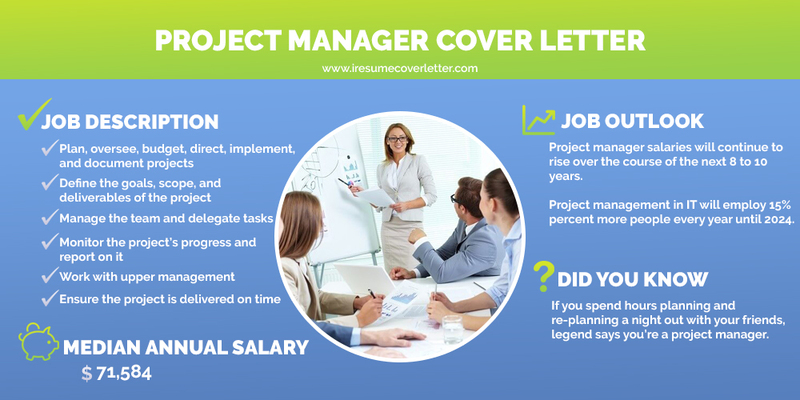 The project manager cover letter examples above show the effectiveness of covering your current job duties, achievements, and job skills right from the start when approaching a potential employer for a new job. Download the one that best suits your needs, and use it to draft your own project management cover letter. Other aspiring project managers can benefit from your experience, too! Now that you’ve reviewed our examples, take some time to share your own cover letter creation experience with others who can benefit from your success on the job market. A project manager cover letter is a key piece of the three-pronged approach to landing your dream job, which also includes a winning project manager resume and effective in-person interview.